William arrived in Australia at the age of 3. He became a farmer but, after many years of farming he moved to a bush block & became a very good axeman. He encouraged his sons to follow him into the sport. He was also very good at preparing racing axes and also passed this skill on to his sons. 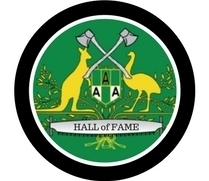 The eldest son Les was a very good axeman and, at the age of 24, he won the 15inch Underhand World Title, Tree felling and Double Handed Sawing at the Sydney Royal Show. Les was a better underhand cutter than standing block but his chopping included many notable successes in both disciplines. Royal Melbourne Show. 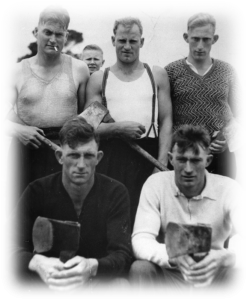 As well as his chopping skills Joe was renowned for his ability in sharpening and grinding racing axes. He was also able to make handles for axes, farming implements and also gun stocks. Alf wasn’t quite as successful in all aspects of woodchopping but he was an excellent tree climber, especially with spurs. Alf was employed by sawmills to cut the tops out of trees & was fearless. While not as prolific as his brothers, Alf was an excellent axeman, a very able teacher & willingly shared his knowledge. Ken carried on the family tradition of excellence & competed well into later life. He also has the ability to grind axes & readily passed this & his woodchopping skills to younger axemen.